New Year’s resolutions tend toward self-improvement. This is the year you will start going to the gym, or finally kick caffeine, or nip in the bud your nascent addiction to cronuts. Maybe you have promised to watch less television, or you have fiendishly reasoned that self-improvement relies on watching more television: you still don’t know what happened at the Red Wedding or who Walter White is, and this is making it hard for you to connect with your fellow human beings. But what if you’re interested in connecting with your fellow human beings in a way that doesn’t require access to premium cable? 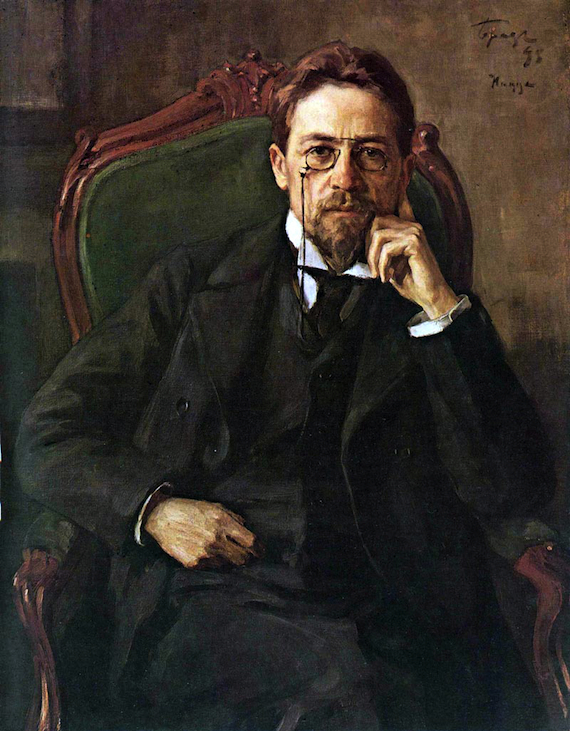 According to a study published in October in the journal Science, reading literary fiction — including the works of Anton Chekhov — increases scores on tests of empathy and emotional intelligence. Who wouldn’t want to be more empathetic in 2014? But before embarking on a self-help tour of late-Czarist Russia, be advised that Chekhov doesn’t provide easy answers to becoming a kinder, more caring person. There’s no five-step solution, no short prayer that will increase your fortunes and lay waste to the fields of your enemies. Instead, he brings us into a world where bad things often happen — and for that world, there’s no better Baedeker than Richard Pevear and Larissa Volokhonsky’s Stories of Anton Chekhov. “Sleepy” tells of a young orphan tending a baby whose crying prevents her from ever sleeping; the girl solves this problem by smothering the baby. In “Anyuta,” a callous medical student draws charcoal lines on the emaciated body of his “roommate” — the poor seamstress Anyuta — to help him study for an anatomy exam; they both know that as soon as he graduates, their relationship will end and he will marry a more respectable spouse. And “In the Ravine” features Aksinya, a woman who pours boiling water on her sister-in-law’s infant son (the baby dies, Aksinya keeps control of the family-owned brickworks, and the bereaved sister-in-law descends into poverty). Chekhov doesn’t make us better people by restoring our faith in the fundamental goodness of humanity or by charming us with the bright hope of a happy ending. In fact, he makes it hard for us to make snap judgments about heroes and villains. Varka, the girl in “Sleepy,” has witnessed the deaths of both parents, she works for a family that abuses her, she is exhausted to the point of hallucination, and her awful crime arises from a primal desire for one moment of peaceful slumber. Aksinya, also guilty of infanticide, acts when her father-in-law declares that her nephew will one day inherit his business — a business which the child’s father has almost ruined, and which Aksinya has devoted her life to saving. None of this excuses their actions, but Chekhov forces us to understand these characters before we can quickly write them off as monsters, as evil-doers. Chekhov isn’t interested in something as flat and simple as evil. Time and again in his work, he draws a link between indifference — the failure of empathy — and cruelty. When terrible things happen in a Chekhov story, it isn’t because one of the characters is a bad seed. It is often because of the characters’ inability to extend to each other the kind of compassion that would force them outside of their own concerns. It’s worth noting that Chekhov’s grandfather was a serf, his father was a hyper-religious tyrant, and he knew from the time he was in his twenties that tuberculosis would cut his life short (he died at 44). He didn’t believe in God or the reward of a joyous afterlife, and yet his stories affirm in ways large and small that the only hope we have lies in our relationships with other people. If the world is hell, it’s because we make it that way; if we are to be happy, it’s only by connecting with the people around us. Lyubov Andreevna is speaking to Trofimov; Chekhov is speaking to us. This writer who sought objectivity in all of his work and who was blasted by his contemporaries for being apolitical and amoral, condenses into this line a plea to us all. That before we judge, we understand. That we extend to each other the same compassion that we all seek. Resolutions are notoriously hard to keep. Gyms are full of people in better shape than you. Cronuts are tasty. Television is hard to kick. And the benefits of caffeine — among them wakefulness and the will to live — are obvious. But with a little help from Chekhov, perhaps 2014 can be the year that we all show a little generosity. Brendan Mathews ’s stories have appeared in Best American Short Stories 2010, Virginia Quarterly Review, Five Chapters, PORT Magazine, and other magazines in the US and UK. He teaches at Bard College at Simon’s Rock in Great Barrington, Mass. Follow him on Twitter @mathews_with1t. We have no idea what we’re talking about when we talk about structure. One of my favorite aspects of working in a bookstore was recommending stock to customers. Since I’ve kept a tight grip on my “to read” list my entire literate life, I was always puzzled and delighted by these strangers in need of book advice. What great power a bookseller has! It’s incredibly gratifying to watch a customer purchase a novel or biography because you convinced them to do so; it’s even better when they return to thank you for the recommendation.I’ve recently become obsessed with the book choosing rituals of those around me. Are you the type to buy a book recommended by the cashier at your local bookstore? Or maybe you’re like my friend Lisa, who falls down the Amazon rabbit hole, one recommendation begetting another. My friend Allison decides on books based on their last word. Seriously. Trusted Millions leader Max has an intense book choosing system known as The Reading Queue. Max’s process is impressive, but the lack of choice would feel burdensome to me. I only buy one book at a time because I can’t handle the expectation and pressure of so many unread books in my apartment, crying out: Pick me! Pick me! When I purchase something, I read it soon after – I scratch that reading itch.Three years ago, Patrick wrote two posts (here and here) about his gender equalizing reading experiment, in which he alternated between reading books by men and books by women. The results were positive: the project broadened his reading habits, and he now reads authors of both genders pretty evenly. I haven’t done anything so regimented, but his experiment did encourage me to shake up my own reading practices. I now keep statistics of what I’ve read, so that I can keep an eye on my tendencies, and go against them if I need to.For instance, I’ve read 12 books since January 1st, 5 by women and 5 by men, the remaining two being anthologies. On the male-to-female ratio, I’d say things are looking good. So far, I’ve only read 2 books of nonfiction, but for me, that’s an improvement. Last year, my 3 books of nonfiction were all about food or food production, so this year I’m branching out to other topics; in 2008 I’ve read Bill Buford’s Heat (food, again), and Adrian Nicole LeBlanc’s Random Family (not food), and was incredibly moved by the latter. I always read a large number of short story collections, but this year those numbers will decrease because I want to read more novels (to help with writing one). Four months into the year, I’ve failed on my dead authors quota. So far, I’ve read only half of Jude the Obscure. Patrick has offered to assassinate Joshua Ferris for me, whose novel Then We Came to the End I’m currently reading, but I think that’s a little extreme. I hope to dip into Flaubert and Wharton this summer to make up for this deficiency.My latest 2008 reading goal is to read more books in translation, something I rarely do. Good thing The Savage Detectives by Roberto Bolano is waiting in the wings. What are you reading this year, and why? Railway tracks get recycled into public pathways, now; in Middlemarch, they aren’t built yet, and exist only in the form of industrial agents who come to plan their route through the fields, to the dismay of the farmers who don’t understand what they want. Wonderful piece. Precise, straight to the point. I taught Russian lit for many years and Chekhov is my all-time favorite. Just reading his work makes me feel like a better human being. I’m in! I just pulled Cherry Orchard from the bookshelf. Please note that the translator of the Cherry Orchard edition cited in this article was the late, dearly missed Prof. *Michael* Heim, (i.e., not “Matthew”). Thanks for the nudge, Brendan. I am already behind in my workout program. Medicine is a free pass into the intimate details of life. William Carlos Williams for poetry. Chekhov is my top literary doc. One more thing to check-off my list for 2014! I am a sadistic little creature so the sound of these stories is most excellent. My next true literary love. For the past few years, I’ve had, at most, five to 10 actual books in my personal library. Yes, you read that correctly, five to 10 books. Recently I did something I’ve been avoiding for a long time: I read literature by people like me, about people like us.